The Olympus E-3, which is Olympus’ flagship DSLR, was announced October 16, 2007 in the US. The E-3 has a 10.1 megapixel Live MOS sensor along with Olympus’ TruePic III™ digital processing engine. Additionally, Olympus touts the new autofocus system as the fastest AF speed in the world with the new ZUIKO SWD lenses. The ZUIKO DIGITAL ED 14-35mm f/2.0 SWD joins the existing ZUIKO DIGITAL 35-100mm f2.0 as the brightest fixed aperture lenses in their class. If you don’t mind the smaller Four Thirds sensor or being limited by 10.1 MP resolution (little room to crop), this is definitely a camera to own and use. The system works perfectly okay for static subjects, and for some things—notably macro photography of non-moving subjects, especially close to the ground—it can work a lot better than the regular optical viewfinder. The viewfinder and AF are two usual scapegoats, but with the E-3, Olympus has significantly improved both. The tunnel-vision of earlier Four Thirds viewfinders has been upgraded to a large and bright experience that inspires you to use the 4:3 aspect ratio. The older basic 3-point AF system has been replaced by a new 11-point system which with the right lens and conditions can perform extremely quickly. 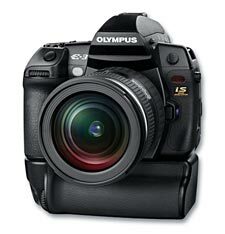 What the Olympus E3 brings to the table is excellent images, a great build quality, and a lovely user experience, but fails to match the innovation of the E-1, or even other models from the Olympus range. Instead it’s taken the best bits, refined them and put them all into a very usable camera. All in all the Olympus E-3 impressed greatly. It is a very well thought-out camera with emphasis on the user. That doesn’t go for many other camera brands. Because of its great reliability, comprehensive feature set, and great image quality, the Olympus model should certainly appeal to the most advanced photo enthusiast. More importantly perhaps, the price is right! In fact, in the professional category, this one deserves my “Best Value” award. It’s not only the most affordable but offers excellent return on the investment, making Olympus competitive in the high-end category. If you need a tough, durable and very capable camera to endure harsh conditions the E3 would be near the top of my list for any camera category. I shoot in many of these situations, can see the utility of the E3 in these circumstances, and would welcome being able to use it. The camera is just not very quick on its feet for general purpose photos or when a quick capture of an elusive moment is called for. And this so perfectly mirrors the DSLR scene in general. It makes sense given that Olympus has pinned its hopes on the E-3 as its most serious digital contender to date. Still, the amount of time you’ll spend penitently wading through the manual will reward you with some seriously good images. Colours are lovely and true-to-nature, and although Olympus may not have quite cracked the old white balance conundrum when faced with tricky conditions, at least you can work around it. Photographing with the Olympus E-3 is a bit like driving a sports sedan. You may not need the speed and power most of the time, but you’re sure glad it’s there when you do. Plus, you get comfort and style with your scoot. The E-3 is more than competent for everyday shooting, and its speed and burst depth handle demanding moments with ease. Then, when you’re pushing pixels, the E-3’s files help you get back to pushing shutters sooner. It’s pretty cool when you can see the white balance change on the screen before you take the shot. Made it very easy to select the right setting for the light, just by scrolling through the presets and stopping at the one that looked best. I’m glad Olympus set about improving the various processing algorithms with their conservative hat on. From colour to noise reduction it seems just about a perfect balance. I’m relieved as I was expecting some pretty aggressive non-selectable Noise Reduction. The first thing I noticed was how fast the new auto focus is. Olympus is claiming that the E-3 combined with their new Zuiko Digital ED 12-60mm f/2.8-4.0 SWD lens has the fastest auto focus currently available. It certainly feels like it could be the fastest, although controlled testing needs to be done. The camera is noticeably larger than the E-510 and has the sturdy solid build and professional feel that the E-1 had. It really feels and behaves like a professional digital SLR body. The autofocus system is highly sensitive and significantly faster, with selectable 11 AF zones. Olympus says that the AF’s unique design uses a layered, slightly offset, CMOS sensor array to improve accuracy and low-light sensitivity. As a result, all 11 AF zones should be active cross-sensor types with any aperture lens. This may be the best AF system we’ve ever seen on an Olympus DSLR. The Olympus E-3 is by far the most advanced Olympus digital camera I’ve used, very satisfying to shoot with, and one of the more compelling SLRs launched this season. Its design, though big, is ergonomically pleasing and handsome, and it gives you a feel of confidence and control. The E-3’s build matches the sturdy feel of Olympus’s high-end lenses, which are some of the tightest we’ve seen. Free HLD-4 grip and backpack for Olympus UK customers. First off, consider going to your local camera store (and I don’t necessarily mean Wolf Camera at the mall). By going to your local camera store, you’re supporting your community and you just might build a lasting relationship with people you can rely on when you need some help or answers. If you’re buying online, I recommend sticking with Amazon, B&H Photo or Adorama. These three vendors are reliable, trustworthy and generally have the best (legitimate) prices. Additionally, purchasing your camera through these links helps support this site. All these Oly improvements will not dent the market for Oly unless Olympus markets a FF sensor equal to Nikon\'s new D3 and Canon\'s D5. That\'s where the future is in digital and film bodies and lenses. All else is illusion. All these Oly improvements will not dent the market for Oly unless Olympus markets a FF sensor equal to Nikon’s new D3 and Canon’s D5. That’s where the future is in digital and film bodies and lenses. All else is illusion. sensor is 2.0x rather than a 1.6x like the 20D/30D – this canon user isn\'t jumping ship anytime soon. sensor is 2.0x rather than a 1.6x like the 20D/30D – this canon user isn’t jumping ship anytime soon. I think the E-P1 probably won\'t convert a lot of current devotees from Canon or Nikon, but it will keep current Olympus users, who have been jumping ship because of the lack of an E-1 successor and give people a place to buy up to from their E-500s and E-330s. If keeps the E-1s \"built like a tank\" reputation there will be a lot of E-1 users who will grab it, as well as current non-E1 users who wanted the build quality, anti dust and seals, but were waiting for a camera with better high ISO response. I think the E-P1 probably won’t convert a lot of current devotees from Canon or Nikon, but it will keep current Olympus users, who have been jumping ship because of the lack of an E-1 successor and give people a place to buy up to from their E-500s and E-330s. If keeps the E-1s “built like a tank” reputation there will be a lot of E-1 users who will grab it, as well as current non-E1 users who wanted the build quality, anti dust and seals, but were waiting for a camera with better high ISO response. Olympus really hyped the Professional E-system when they launched it several years ago. Since then, little has happened on the professional front. Had I chosen to buy into their E-system, I\'d have felt let down by Olympus for years. Whatever they come up with now, I know they are just full of hot air. Imagine buying their expensive lenses and an E1 body or maybe several, only to find Olympus not updating the pro body model for several years, leaving their pro users with a 5 MP camera. Damn, they deserve to go bankrupt. And, the 4/3 \"standard\" may be relevant to amateurs, but when it comes to the professional market, they have painted themselves into a corner. Crackheads. Anyway, Olympus 4/3 system is a \"professional\" dead end. Olympus really hyped the Professional E-system when they launched it several years ago. Since then, little has happened on the professional front. Had I chosen to buy into their E-system, I’d have felt let down by Olympus for years. Whatever they come up with now, I know they are just full of hot air. Imagine buying their expensive lenses and an E1 body or maybe several, only to find Olympus not updating the pro body model for several years, leaving their pro users with a 5 MP camera. Damn, they deserve to go bankrupt. And, the 4/3 “standard” may be relevant to amateurs, but when it comes to the professional market, they have painted themselves into a corner. Crackheads. Anyway, Olympus 4/3 system is a “professional” dead end. Olympus is great as long as youre not a PRO. I used to own the E-1 and E500 some of their expensive lenses, and the lack of timely upgrade to their E-1 made me jump to Canon. Im happy I did. I hope the E-1 replacement is good though… the competition helps. Olympus is great as long as youre not a PRO. I used to own the E-1 and E500 + some of their expensive lenses, and the lack of timely upgrade to their E-1 made me jump to Canon. Im happy I did. I hope the E-1 replacement is good though… the competition helps. Olympus Professional e systems were not designed for super high-end photography, and it is not fair to compare it to the Canon Eos 1d systems. Olympus developed the 4/3 system specifically for digital media. When you look at the web, you really can\'t tell the difference between a photo taken by Canon vs Olympus 4/3. That\'s what the Olympus was really designed for. Look at their website and read the history of the 4/3 system, and what it was designed for. Yes, professional photographers can carry this too. I feel a bit uncomfortable walking around with a $5000 Canon Camera, versus walking around with a much cheaper Olympus that can give me the same final result for digital media. In the end, it comes down to the person behind the Lens, not the camera in front of the person. Olympus Professional e systems were not designed for super high-end photography, and it is not fair to compare it to the Canon Eos 1d systems. Olympus developed the 4/3 system specifically for digital media. When you look at the web, you really can’t tell the difference between a photo taken by Canon vs Olympus 4/3. That’s what the Olympus was really designed for. Look at their website and read the history of the 4/3 system, and what it was designed for. Yes, professional photographers can carry this too. I feel a bit uncomfortable walking around with a $5000+ Canon Camera, versus walking around with a much cheaper Olympus that can give me the same final result for digital media. I don\'t know if this has been discussed but the official website itself discusses the Tele Converter EC-20 on http://www.olympusamerica.com/cpg_section/lens/de…I looked all over the website for any info on the ec-20 &amp; that is the only place that it\'s own internal search engine pulled up any reference to it. I don’t know if this has been discussed but the official website itself discusses the Tele Converter EC-20 on http://www.olympusamerica.com/cpg_section/lens/dea/products/lens/70-300_40-56/index.asp I looked all over the website for any info on the ec-20 & that is the only place that it’s own internal search engine pulled up any reference to it. About a year ago I switched from Nikon Pro Gear to Olympus Pro gear. For what i do (which is traveling and shooting for books mostly). A 5mp RAW file is more than adequate. I now have two E-1\'s and a handful of lenses (all bright and weather sealed) and i spent far less than what a new (or used for that matter) D2x would cost (not to even mention lenses). The E-1\'s are small, portable, and built like tanks. I have seen them completely submerged in streams when a tripod was tipped over and come up unharmed. I don\'t think any of my Nikons could have handled that. Olympus may have taken a long time to come out with a replacement, but I\'ll stick with them. They have had a self cleaning sensor for years(sensor dust has always been one of my biggest gripes with my Nikons) and they also beat everyone else to live view. I\'m intrigued what innovation they will come out with next. But, as Johnny Appleseed mentioned above, who cares what camera someone is using, its the end result and the image that are really important. Unless your only into cameras and not photography. About a year ago I switched from Nikon Pro Gear to Olympus Pro gear. For what i do (which is traveling and shooting for books mostly). A 5mp RAW file is more than adequate. I now have two E-1’s and a handful of lenses (all bright and weather sealed) and i spent far less than what a new (or used for that matter) D2x would cost (not to even mention lenses). The E-1’s are small, portable, and built like tanks. I have seen them completely submerged in streams when a tripod was tipped over and come up unharmed. I don’t think any of my Nikons could have handled that. Olympus may have taken a long time to come out with a replacement, but I’ll stick with them. They have had a self cleaning sensor for years(sensor dust has always been one of my biggest gripes with my Nikons) and they also beat everyone else to live view. I’m intrigued what innovation they will come out with next. If you look at the history of photography you will see that each successive advancement has been to smaller rahther than larger formats. From 8×10 cameras to 4×5 cameras to medium format to 35mm and now to digital. In each case we wnated smaller lighter equipment that gave us better and easier to get results. Why all of a sudden have we decided that we should go against this trend adn go back. I for one enjoy the ease of use and protability that I et from my E system stuff. The images are great even when enlarged to sizes most people would never dream of. With the advancement of the printing technologies in combination with the camera advances who needs larger heavier stuff to lug around? Smaller, Lighter and more Rugged equipment is the way of the future. When are people going to comprehend the fact that it\'s all about the ability to photograph beyond your comfort zone. The E-1 and it\'s successor enable the photographer to go anywhere and shoot anything. Plus the crop factor of 4/3rds allows for smaller, more compact lenses. As with all facets of this digital revolution we are living through at the moment, it should all be about shrinking hardware, allowing for more convenient and expressive explorations of our world. Canon full frame people need to get off their high horse and think practically. Smaller, Lighter and more Rugged equipment is the way of the future. When are people going to comprehend the fact that it’s all about the ability to photograph beyond your comfort zone. The E-1 and it’s successor enable the photographer to go anywhere and shoot anything. Plus the crop factor of 4/3rds allows for smaller, more compact lenses. As with all facets of this digital revolution we are living through at the moment, it should all be about shrinking hardware, allowing for more convenient and expressive explorations of our world. Canon full frame people need to get off their high horse and think practically. I am a professional photographer for a long time. I shoot wedding and people. When I was in high school I learned that the eye of the photographer has to make the picture. My teacher told me this: If I give you a old Agfa Click/Clack you must make good and beautiful pictures with feeling in that picture. If you cannot do that no camera will ever be good enough for you. I use E1 with all there Pro line lenses allso E500 because I had to wait for the E3. So if there is a Canon or a Nikon or what ever in the wrong hands nothing will work. But I love the Olympus and I allways will. I have never understood the \"full (35mm equiv.) sacred\" format and size for digital photography. With the great advances in technology why not shoot for a smaller sensor size with the attendant reduction in lens size and weight. If most pros need the extreme ruggedness and shutter life of the expensive, heavy, pro cameras from Nikon or Canon that\'s fine. I prefer a lighter, more comfortable setup to carry around with me. I also prefer the 4/3 format which has always appeared more attractive to me. The new 12-60mm lens from Olympus would be my cup of tea as I prefer the wide angle instead of the more extreme telephoto. I have been using a Pentax K10D with 16-50mm DA* lens and love the combo. If I were looking for a new camera I would definitely go for the E3, 12-60mm combo. I wish Olympus good luck in the future as i believe they have the right idea. I have never understood the “full (35mm equiv.) sacred” format and size for digital photography. With the great advances in technology why not shoot for a smaller sensor size with the attendant reduction in lens size and weight. If most pros need the extreme ruggedness and shutter life of the expensive, heavy, pro cameras from Nikon or Canon that’s fine. I prefer a lighter, more comfortable setup to carry around with me. I also prefer the 4/3 format which has always appeared more attractive to me. The new 12-60mm lens from Olympus would be my cup of tea as I prefer the wide angle instead of the more extreme telephoto. I have been using a Pentax K10D with 16-50mm DA* lens and love the combo. If I were looking for a new camera I would definitely go for the E3, 12-60mm combo. I wish Olympus good luck in the future as i believe they have the right idea. I\'ve been happily using (mostly mechanical) OM\'s for 3 decades. Their small size and weight and superb ergonomics have been winners for me. However, now that I\'m looking at going digital, I might move to another family. Some of my favorite 35mm Zuiko lenses are 55/1.2, 21/3.5 and 180/2.8 and I get \"wow\" results with them consistently. It won\'t be easy to get those wide-angle and shallow DOF effects with a smaller sensor; that\'s just simple optic geometry. This is where a FF sensor (e.g. Canon) makes life so much easier. Sure, those lenses will be larger, heavier and more expensive, but the final result in the photo could be more pleasing. I have yet to try these new cameras and feel the ergonomics (love my mechanical OM-3!) and I might even mount my old Zuikos on an E3, but 4/3 might be limiting for certain types of photography. Perhaps small sensor gear (e.g. 4/3) will turn out to be the new 35mm and FF sensors will be the new MF – maybe that\'s the best characterization for this issue. If so, then Olympus has some great offerings in it\'s class. I’ve been happily using (mostly mechanical) OM’s for 3 decades. Their small size and weight and superb ergonomics have been winners for me. However, now that I’m looking at going digital, I might move to another family. Some of my favorite 35mm Zuiko lenses are 55/1.2, 21/3.5 and 180/2.8 and I get “wow” results with them consistently. It won’t be easy to get those wide-angle and shallow DOF effects with a smaller sensor; that’s just simple optic geometry. This is where a FF sensor (e.g. Canon) makes life so much easier. Sure, those lenses will be larger, heavier and more expensive, but the final result in the photo could be more pleasing. I have yet to try these new cameras and feel the ergonomics (love my mechanical OM-3!) and I might even mount my old Zuikos on an E3, but 4/3 might be limiting for certain types of photography. Perhaps small sensor gear (e.g. 4/3) will turn out to be the new 35mm and FF sensors will be the new MF – maybe that’s the best characterization for this issue. If so, then Olympus has some great offerings in it’s class. I am always amused by posts that claim that the E1 did not have enough MP at 5, and now the corollary here with the E3. For some reason, it wasn\'t a problem for Pros to use the D1X or D2H, et cetera, yet for some reason, it was with the E1. Yes, I know that other pro cameras went to higher resolutions, but that still doesn\'t reduce the veracity or professionalism of images shot before. Regardless, if someone is happy with Nikon or Canon, please continue your enjoyment. I personally think that many of the innovations Olympus has, and continues to make are of merit and further the art of photography. I am always amused by posts that claim that the E1 did not have enough MP at 5, and now the corollary here with the E3. For some reason, it wasn’t a problem for Pros to use the D1X or D2H, et cetera, yet for some reason, it was with the E1. Yes, I know that other pro cameras went to higher resolutions, but that still doesn’t reduce the veracity or professionalism of images shot before. When I decided to buy an E1 last year, production was stopped and I coul not find a new one. I got a second-hand in a store in Paris. It is light and simple to use (more than my C7070WZ Oly), one button, one function, a good viewfinder, perfect handling and natural colors. 5mp is enough for A4 printing and 400iso Is good, eventually 800 Iso. No problem for dust or mist, it\'s a fine camera for everyday user. The pity for Oly is they have been for two years at least without expert DSLR. You can use on E500 a lense which cost five or six times the price of the camera but who did? E3 arrives a little late on the market and at the same time that 40D and D300. Bigger viewfinder, anti- blurr and flash make it bigger and now weight and size are about the same on three cameras. I think it will arrive for sale in France in november and I\'ll run to try it. I appreciate the relation Olympus keeps with customers. Any problem or question will find a solution or an answer very quickly. Canon seems to prefer to pay for advertising than customer satisfation. New products, advertising = new customers. I had a problem with my last SLR 35MM film with a flash out just after warranty period, nothing to do . I use Olympus since 2005 for digital, it\'s a good choice will go on. When I decided to buy an E1 last year, production was stopped and I coul not find a new one. I got a second-hand in a store in Paris. It is light and simple to use (more than my C7070WZ Oly), one button, one function, a good viewfinder, perfect handling and natural colors. 5mp is enough for A4 printing and 400iso Is good, eventually 800 Iso. No problem for dust or mist, it’s a fine camera for everyday user. The pity for Oly is they have been for two years at least without expert DSLR. You can use on E500 a lense which cost five or six times the price of the camera but who did? E3 arrives a little late on the market and at the same time that 40D and D300. I think it will arrive for sale in France in november and I’ll run to try it. I appreciate the relation Olympus keeps with customers. Any problem or question will find a solution or an answer very quickly. Canon seems to prefer to pay for advertising than customer satisfation. New products, advertising = new customers. I had a problem with my last SLR 35MM film with a flash out just after warranty period, nothing to do . I use Olympus since 2005 for digital, it’s a good choice will go on. Right now the Olympus Pro-Line lenses offer the widest wide angle on any digital SLR 7-14 mm (14 to 28 equiv) and f 2.0 lenses from 14 to 100 mm (28 to 200) and F 2.8 zoomto 250 mm (500 mm equiv). Even Cannon\'s huge lenses are this fast at equivalent focal lengths. I\'m buying the E-3 because it has the best big glass available. The glass should be good for many many years. I\'ll get a new back when they come out with the E-4 and still have better lenses that Nikon or Cannon offers. Right now the Olympus Pro-Line lenses offer the widest wide angle on any digital SLR 7-14 mm (14 to 28 equiv) and f 2.0 lenses from 14 to 100 mm (28 to 200) and F 2.8 zoomto 250 mm (500 mm equiv). Even Cannon’s huge lenses are this fast at equivalent focal lengths. I’m buying the E-3 because it has the best big glass available. The glass should be good for many many years. I’ll get a new back when they come out with the E-4 and still have better lenses that Nikon or Cannon offers. Many good things some are saying about the E3 – and some very biased negative comments from people who have held one — it really is not until one uses it that one can give an honest appraisal. The proof is in the pudding! Look at real images from a production model E-3. From there, there is a further link to http://safari.thegovernment.eu so people can download the raw files taken last weekend. The images speak for themselves — the E-3 is a great camera! Thanks for the info and the link to your site. I’ve placed it in the reviews above. Good luck with your new 510. Keep us posted with your thoughts on the Olympus system. What does more megapixels get you? A photo that you can print large. More space used up on your storage media (on camera and on the computer). I’ve had the E-1 for a couple of years now. Most people (even pro work) don’t print so large that 5 mp is inadequate. For exhibition sized prints, it’s not been enough for me, I’ll admit. For digital media and most other print media, it’s been the right size. The E-3 with its 10 mp image should be enough for 16×20 and maybe even 20×25. So I’ll probably be getting one and I know I’ll be happy with it. In addition, the 4/3 format has its pros and cons. I like the wider aspect ratio that you get with say a Canon. I used to always print full frame when shooting 35mm. I love the look. But the 4/3 aspect ratio does correspond better with a lot of print media. It’s true what Olympus says about the wider aspect ratio — mostly it’s a waste of pixels, so your 6 mp Canon really becomes a 5 mp camera for practical purposes. I guess you do get more cropping options with a wider image though (and more mps), but I don’t usually crop, unless I’m forced to. I have not been too happy with the noise at high ISO settings on the E=1. That’s where I envied the Canons, I’ll also admit. I’m wondering whether that has improved with the E-3. Hope so. I understand the frustration with the delay in coming out with a new pro camera. The digital camera market is a fast moving one. Seems like this should have arrived at least a year ago. It does appear that Olympus has put a lot of thought into the camera though. I find the E system to be a most useful and interesting line of cameras on the market. The other day I was in a Photo shop and next to me was a so called “Pro” buying a multi-K-Euro Canon kit. He commented that moving from analogue to digital made him loose up to 10% of all his images in shooting sessions due the complexities of digital versus analgoue. Hence, the investment in the new gear! With further talk I was assured that it is more important the know-how than high-end gear and for that matter I will stick to my E-510, investing mostly in learning the physics of light rather that be baffled by Megas (whatever that means!). I’ve got the E-3 finally, Amazing, go get one. That’s awesome! Congrats. I can’t wait to hear more from you about it. By the way, your portfolio is amazing. Let me know when you get some E-3 shots up. Just letting you know that I will taking down the website that contained my “My Oly – I am In Love” journal entry – – – and have moved it to my main website. The link above will no longer be active. Sorry.